I constantly get asked about my skincare routine and what products I use. Honestly, I love to change it up and adapt my routine to my skin’s needs at that time BUT there has been one failsafe product that has been a part of my daily beauty routine for over a year now – day in, day out. My trusty Magnitone cleansing brush. This is a cleansing brush like no other, so much so I have somehow accumulated 3 – one lives in the shower (yes, they are waterproof! ), one lives at the basin and one is to travel with. No matter how my skin is feeling this brush is always gentle enough not to aggravate any sensitivities and effective enough to deep cleanse my skin. All in one little minute. Check out my Oily Skin Heroes featuring the Magnitone Barefaced YoutTube video at the bottom of this post! I literally could not go one day without using my Magnitone. It cleanses your skin on a level that makes your skincare products so much more effective, and we all know how much I love my skincare. I fell in love with it when I really understood the technology behind it, coupled with the fact it is ridiculously easy to use and adds no extra time into my daily routine. You would (hopefully) be cleansing your skin anyway, so why not make it more effective with Magnitone? 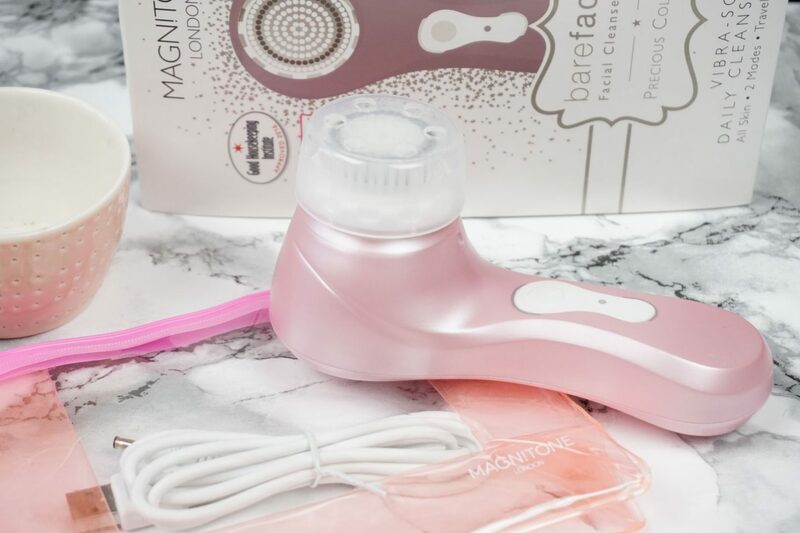 The Magnitone Barefaced is different to other facial cleansing brushes on the market, it doesn’t just go back and forward on the surface of your skin. It deep cleanses, massages and tones skin with a combination of sonic oscillations + pulsed vibrations. The Vibra-Sonic™ technology is 6x more effective* than traditional cleansing with hands. Sending pulses into your skin that wobble the dirt out the depths of your pores – where cleansing with your hands can’t go! When I had my Visia Complexion Analysis (see post here) I showed you the amount of environmental bacteria that gathers on our skin when we live in a city – it was disgusting! There are so many invisible micro-pollutants that fly about in the air and block up our pores. If you want a reminder of what that actually looked like . 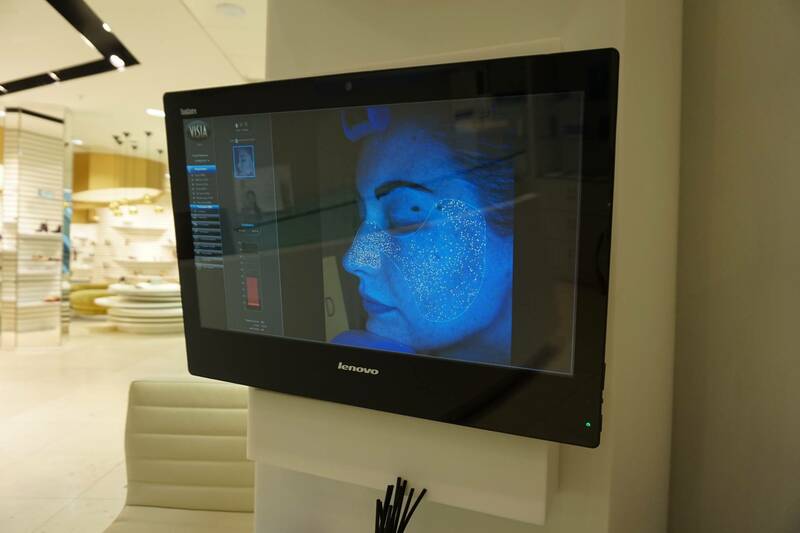 . . this bacteria gathered on my face in the 15 minute walk to Harvey Nichols Edinburgh (I had hand-cleansed that morning knowing I was going for a facial). So my daily cleanse with Magnitone keeps me sane knowing that I am cleansing all of this invisible bacteria out of my pores on a daily basis. 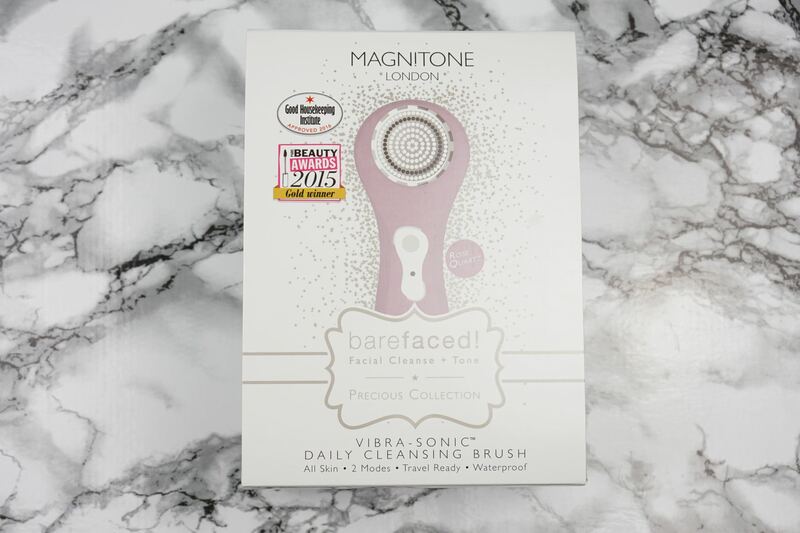 Magnitone is a BRITISH company, which I love, compared to other well-known cleansing brush brands that are part of huge multinationals. It’s lightweight to use, hold and easy to travel with. In just one minute dead skin cells are gone and pores are clean, I absolutely noticed a difference in the appearance of my skin after first use and over time feel it has helped with my skin’s brightness and the size of my pores. The Active Clean brush head that comes as standard with your Magnitone Barefaced is super soft & silky on your skin and not abrasive in any way. Cleansing with my Magnitone allows my skincare products to absorb deeper into my skin, and not just sit on the surface. Zack loves the Magnitone too, he now has his own brush head and uses it in the shower before he shaves! I use my Magnitone with a small amount of my gel cleanser (added bonus – you use MUCH less product when cleansing). I dampen my face and brush head and apply a small dot of cleanser in the middle of the brush, so simple! 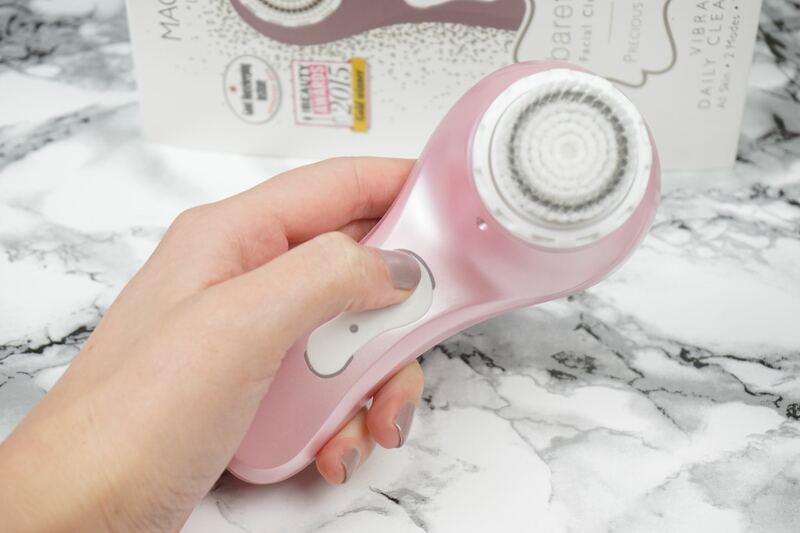 If I am in a rush I take the Magnitone into the shower with me and use it in there, if I have the time I do an extra minute on my décolletage area where I find I can also get congestion. I have tried with an oil cleanser but find I need to clean the brush after to make sure there is no product residue. So my mastered routine is a quick oil cleanse as my first cleanse and my second cleanse with my Magnitone and gel cleanser. It’s amazing to see that after using micellar water, and an oil cleanse there can still be some dirt coming off your face! There are two cleansing modes, press once for daily cleanse and twice for PulseLift™ Toning. Pulse-Lift mode works in exactly the same way as your daily cleanse but with added oomph, toning and tightening your skin – perfect for your neck area! 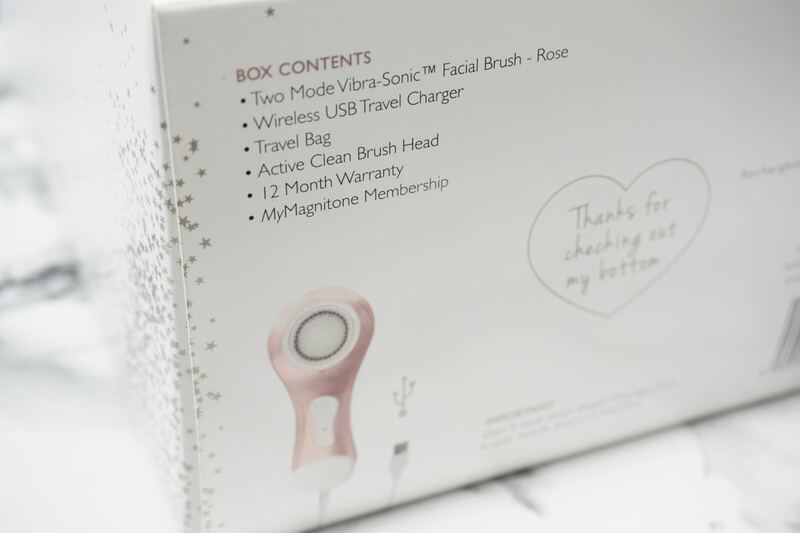 The beauty of the Magnitone barefaced! is it is SO easy to travel with – one charge should last you a month, but if you need to charge on the go, it could not be more simple. 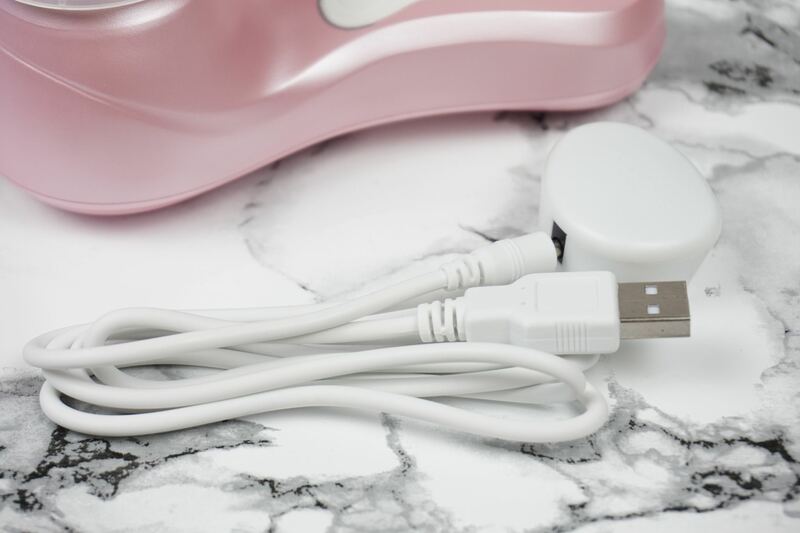 You charge it via USB port that can be attached to your smartphone plug or computer, pop it in it’s splash proof bag and get on your way. It is so light it is easy just to pop into your gym bag, weekend bag or take on holidays with you! Replace your brush heads every 3 months to keep your cleanse affective. I couldn’t imagine my cleansing routine without my Magnitone now!